Location: East of the B4381 and on the western side of the A483 roads. Present state: Extant in use as retail outlet store. Notes: Welshpool station was situated on the Cambrian Railway (CR) main line that linked Aberystwyth and Whitchurch. The section of line on which the station was located was opened between Pool Quay and Welshpool on 14 August 1860 and between Welshpool and Abermule by the Oswestry & Newtown Railway (O&NR) on 10 June 1861. The company had previously opened a section of line between Oswestry and Pool Quay on 1 May 1860 and between Newtown and Abermule on 14 August 1860. At Newtown the O&NR had an end-on connection with the Llanidloes & Newtown Railway (L&N) which had opened to goods services on 30 April 1859. From 27 January 1862 Welshpool was also connected directly to Shrewsbury by the Shrewsbury & Welshpool Railway (S&W) which opened to Buttington. The S&W was worked by the London & North Western Railway (LNWR). On 25 July 1864 the L&N and O&NR merged with the Oswestry, Ellesmere & Whitchurch Railway and the Newtown & Machynlleth Railway to form the CR (which also absorbed the Aberystwyth & Welch Coast Railway [sic] in 1865). The merger of the companies created the through route between Aberystwyth and Whitchurch. Welshpool’s first station opened on 14 August 1860. It was located on the south-eastern edge of the town. The CR main line was mostly single track but the section between Welshpool and Buttington was double from January 1862. The station had two platforms. The main facilities were located on the up platform (Whitchurch direction) and consisted of an exceptionally large building for the town it served; its size reflected the intention to accommodate the O&NR offices. The building, which survives, is in the French Gothic style. Biddle (2003) describes the structure in the following words: ‘The long, two-storey brick and ashlar-trimmed building has a tall French pavilion at each end, with steep-pointed dormers and elaborate iron railings along the flat tops. Between them are four dormers, two gabled and two hipped, divided by two large gables bearing blank shields. A central plaque displays the Prince of Wales feathers emblem of Wales, under which a lean-to verandah fills the long recess on carved wooden brackets displaying tiny lions’ heads on the outer ends. Some of the mullioned windows have Gothic decoration, and the overall symmetry is broken by one at the south end where stepped sills accommodate an internal staircase. 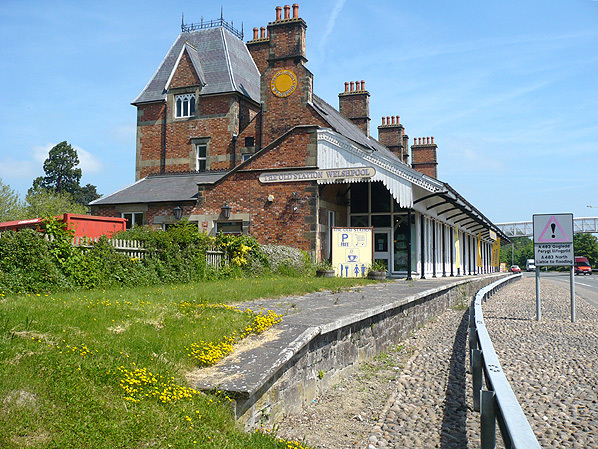 The steep-sloping platform awning is now directly fronted by the dual carriageway, glazed-in but otherwise complete on thin iron Gothic-arched ribs and columns by S Morris’s foundry, Welshpool, including pretty end-valancing.’ From February 1860 until January 1862 the Welshpool station building was the headquarters of the O&NR. At first the down platform (Aberystwyth direction) was fairly basic but by the 1870s it had become an island platform with two faces both served by down lines. Extending further north than the up platform but not as far south It was provided with a lengthy umbrella awning of ridged profile sheltering buildings of no architectural distinction. A covered footbridge, located to the north of the up platform station building, linked the platforms. Welshpool was also provided with goods facilities located to the north of the station, west of the line. They included sidings, a large goods shed, a loading wharf and a 6-ton lifting crane. On the east side of the line to the north of the station was a locomotive shed. When the O&NR opened throughout on 10 June 1861 there were six trains in each direction on Monday-to-Saturday and two each way on Sunday. The LNWR operated trains between Welshpool and Shrewsbury over the S&W from 27 January 1862. In 1865 the S&W line became a joint railway of the LNWR and the Great Western Railway (GWR). By 1864 the CR main line was complete and Welshpool had up services to Oswestry, Whitchurch and Shrewsbury and down trains to Machynlleth and Llanidloes. There were also terminating services of the LNWR and, after 1865, of the GWR from Shrewsbury. By the 1880s the station had also gained a bay platform. It was at the north end of the up platform. The platforms were numbered 1 to 4. Platform 1 was the east face of the down platform and 2 the west face. Platform 3 was the up platform and the bay was platform 4. During the 1890s improvements were made along the CR main line which resulted in better timekeeping and faster services. However the average speed of an express train between Whitchurch and Aberystwyth was still only 28mph. The December 1895 timetable showed eleven up and seven down trains on Monday-to-Saturday. There were also six terminating services from the Shrewsbury line and an extra train in each direction on Monday only. There was also an extra down train on Tuesday. Welshpool was re-signalled in 1897 and two LNWR design signalboxes were provided. Welshpool South box was located at the south end of the up platform. it controlled the southern end of the station and the single line section that ran southwards to Forden. Welshpool North box was located to the north of the goods shed on the west side of the main line. It controlled the north end of the station and the connections with the goods yard and locomotive shed. It was provided with an LNWR Tumbler locking frame. On 4 April 1903 a 2ft 6in-gauge 9½-mile branch line was opened from Welshpool station to Llanfair Caereinion by the Welshpool & Llanfair Railway (W&L). The line was worked by the CR and passenger services were operated. A platform was provided to the north of the original station on the west side of the line at the south-east end of the goods yard. Transhipment facilities were also built in the goods yard so that goods could be exchanged between standard and narrow gauge trains. In 1921 the GWR introduced a Paddington – Aberystwyth summer weekdays restaurant car express service which called at Welshpool. The train had portions that served Pwllheli and Barmouth. On 1 January 1922 the CR was absorbed into the Great Western Railway (GWR). The July 1922 timetable showed 14 up and 10 down trains on Monday-to-Saturday. There were also four down trains that terminated at Welshpool. Extra up services ran on Saturday, Monday, Wednesday and Friday. There were through express trains in the up direction to London Paddington, Birmingham Snow Hill and Birkenhead Woodside. On the W&L line there were four up and three down trains on Monday-to-Saturday with an extra service each way that ran on Tuesday, Wednesday and Saturday only. On Sunday there was only one train in each direction on the main line. In 1923 the W&L company was absorbed into the GWR. Passenger traffic was poor and had to compete with a bus service operated by the GWR. During 1925 the section of line between Welshpool and Forden was doubled which addressed some of the capacity issues on the line. In 1927 the Paddington – Aberystwyth train was given the title Cambrian Coast Express. On 9 Februry 1931 the Llanfair passenger service was withdrawn. In the same year Welshpool South box was closed and Welshpool North was renamed as Welshpool. It was re-equipped with a second hand Dutton frame. By the late 1930s the Cambrian Coast Express had become Saturday-only. It was withdrawn after the Britain entered the Second World War on 3 September 1939. During the war the Llanfair branch saw an upturn in freight traffic which ensured its survival. In summer 1946 the GWR reintroduced the Cambrian Coast Express on Saturday. On 1 January 1948 Welshpool became part of British Railways [Western Region] (BR[WR]). The summer timetable for 1949 showed 13 up and 7 down services on Monday-to-Friday as seen in the table below. There were also five terminating services from the Shrewsbury line. On Saturday there were 17 up and 11 down trains. There was one train in each direction on Sunday. In 1954 the Cambrian Coast Express became a daily service. As goods coming from the Llanfair branch had to be transhipped at Welshpool station the operation had become uneconomic by the mid 1950s. Road transport could more easily take goods to and from the rural area. BR[WR] decided to close the line and the last train ran on 3 November 1956. The 15 September 1958 timetable showed 11 up and eight down trains on Monday-to-Saturday. There were also two terminating down trains. On Saturday one of the through down trains, an evening service from Whitchurch, terminated at Welshpool. The Cambrian Coast Express trains passed at Welshpool. The up train departed from Welshpool at 2.07pm and the down at 2.06pm. After closure the Llanfair branch remained in situ as discussions had begun about preserving it. The Welshpool and Llanfair Light Railway Preservation Company Limited was set up in 1960 and leased the line from BR at the end of 1962. From Welshpool station the Llanfair branch wound its way through the streets of the town until it reached the outskirts and ran into open countryside. 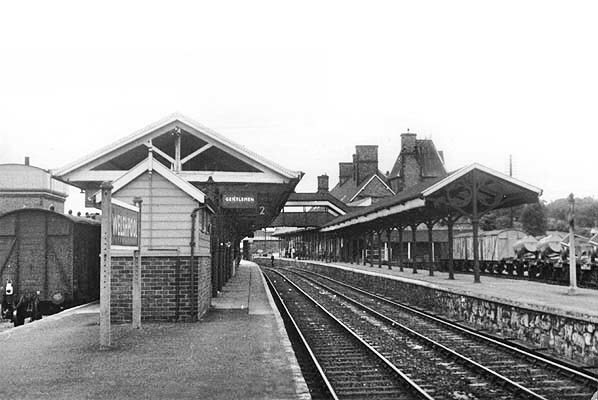 The town council informed the preservationists that they would not be allowed to use the town section of line which meant that Welshpool station would no longer be the terminus. On 1 January 1963 Welshpool passed to the operational control of British Railways [London Midland Region] (BR[LMR]). Three months later the Reshaping of British Railways report (the ‘Beeching Report’) was published. What was, by then, the main through route from Shrewsbury to Aberystwyth was to be retained for passenger traffic, but with only Welshpool, Newtown, Machynlleth and Dovey Junction stations to remain open. The line from Buttington Junction to Whitchurch was to lose its passenger service and close completely between Buttington and Llyclys. Curiously, the Dovey Junction to Pwllheli line was to be left unscathed. In 1964 the section of line between Welshpool and Buttington Junction was converted into two parallel bi-directional single lines. The former up line became the up and down Oswestry line and the former down the up and down Shrewsbury line. This allowed the signal box at Buttington to close and Welshpool became the location at which Shrewsbury and Oswestry line trains diverged for their respective routes. On 15 May 1964 the intention to close the intermediate stations named by Beeching was published. On 29 December 1964 the Minister of Transport, Thomas Fraser, announced that all of these stations, bar one, would close; only Caersws was saved; it was notionally the railhead for Llanidloes. 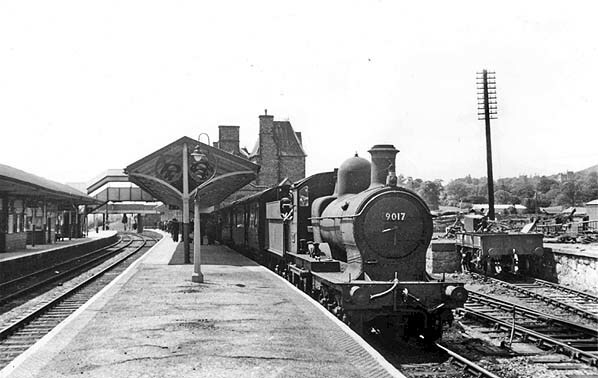 BR[LMR] closed the stations between Buttington and Whitchurch (except for Oswestry) on 18 January 1965. 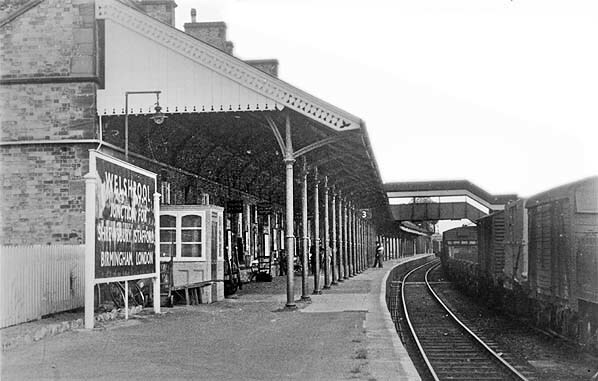 The minor stations between Shrewsbury – Aberystwyth closed on 14 June 1965. After the closure of the line between Buttington Junction and Llanclys on 18 January 1965 that line was lifted. This meant that the Welshpool signal box controlled only a single track route to the north for the first time since 1862. 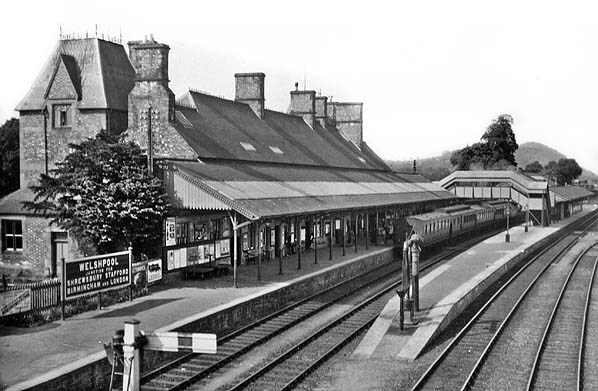 On 14 June 1965 the line between Welshpool and Forden reverted to being single track making Welshpool station the only passing place between Shrewsbury and Newtown. The last Cambrian Coast Express ran on 4 March 1967. By 1974 platform 1 and 4 had been taken out of use. The 5 May 1975 to 2 May 1976 timetable showed Welshpool as having only seven up and six down trains on Monday-to-Saturday. There was an extra train in each direction on summer Saturdays. There were two trains in each direction on Sunday between 8 June and 7 September only. In October 1988 Welshpool signal box was closed when the line became controlled by the Radio Electronic Token Block system from Machynlleth signal box. During the 1980s plans were drawn up for a Welshpool bypass. Its route was to take up part of the railway including the section through Welshpool station. The main line was to be moved slightly to the east and a new station was built on the new alignment to the north-east of the original. Work began in 1991 and the new station was ready by May 1992. The last trains called at the original station on Saturday 16 May 1992. On the Sunday 17 May buses replaced trains while the track was slewed onto the new alignment so that the new station could be used. The new station opened on the 18 May 1992 and the original station was closed. The down platform was demolished and the bypass was built on the trackbed. The O&N station building was retained and during 1995/6 it was refurbished and became a retail outlet. To see more tickets and a handbill click here. Britain's Historic Railway Buildings - Gordon Biddle - Oxford University Press 2003. The Cambrian Railways A New History - Peter Johnson - OPC 2013. Welshpool station looking east in the early 20th Century. 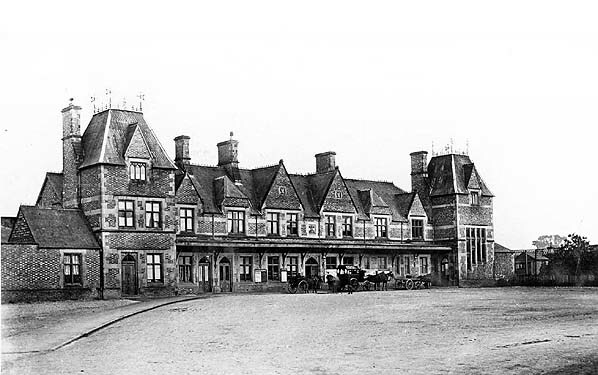 The imposing building was the headquarters of the Oswestry & Newtown Railway between February 1860 and January 1862. Welshpool station shown on a six-inch scale map from 1886. The extensive railway facilities are clearly shown. Welshpool station shown on a 1:2,500 scale map from 1902. The map was drawn the year before the Welshpool & Llanfair Railway had opened so it is not shown. The Smithfield Cattle Market had its own siding which is shown on the map. To see a larger version of the map click here. A view looking north-east at Welshpool station from the road overbridge in the 1920s. A train can be seen standing at the up platform which is to the left. To the right is the island platform that served two down lines. The up platform was numbered as 3 and the two down platforms as 1 and 2. In June 1956 ex-GWR 4-4-0 Collett ‘Dukedog’ locomotive number 9017 is seen standing in the bay platform, number 4, at Welshpool station on a local passenger working. The bay was adjacent to the up platform to the north of the station building. Number 9017 was built by the GWR and entered service in March 1938. It was withdrawn in October 1960. 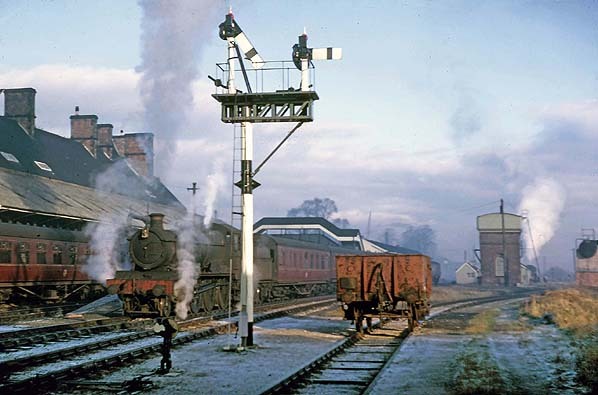 A busy winter scene at Welshpool in the early 1960s. Express services occupy platforms 1 and 3 and in the distance a locomotive can be seen on shunting duties. Looking north along the up platform which was numbered as 3 in 1964. A goods train can be seen passing through platform 2 on the down line. To the right is the large running-in board which informs passengers that Welshpool is the Junction for services to Shrewsbury, Stafford, Birmingham and London. Interestingly the actual junction at which the line to Shrewsbury diverged from the former Cambrian main line was 2 miles 54 chains to the north-east at Buttington. 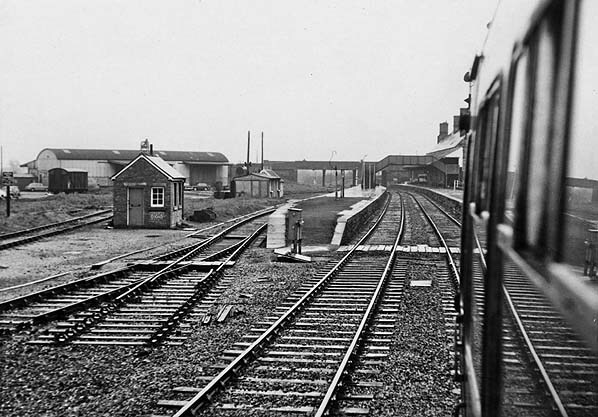 A view looking south-west along the down platform at Welshpool in 1964. Platform 1 is to the left and 2 to the right. Welshpool station looking south-west from a departing DMU service in 1971. Rationalisation had begun and the lines that had previously served platform 1 are disconnected. The island platform and the north end of the up platform had also lost their canopies. A view of the original Welshpool station looking north-east on 9 June 2013.